Click Here to view the electronics schematics page. This page is provided so you can park & shuttle back and forth between the schematic page and this explanation of switching functions. The 2 'Rythm' / 'Solo' switches work for each front and rear pair of 2 pickups. Those switches insert a filter capacitor into the circuit for each bank of 2 pickups, lowers the pickups volumes, and joins the ever-decreasing blend of other pickups volume settings, ....created through series ganged wiring of combined pickups and bleed-through the back side of each pickup's pot, depending upon which pickups are selected and their volume settings. 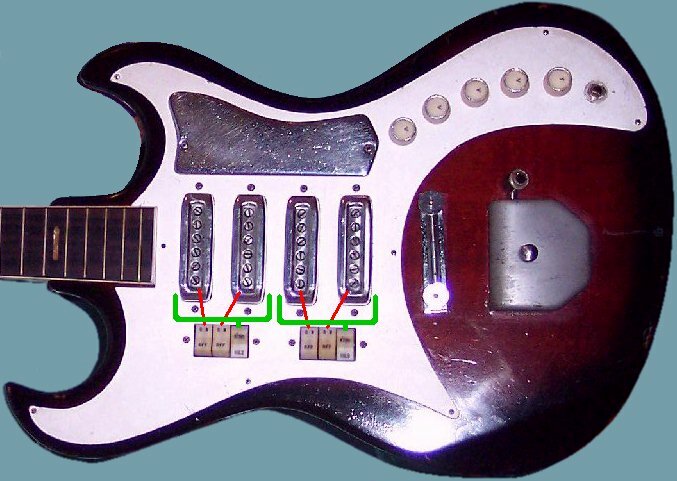 The 'Rythm' circuit also serves to tame the "raucus" character of the pickups when selected 'On' and the 'Solo' / 'Rythm' switch in the 'Solo' positions, ....especially when 3 or more pickups are On. With the pickups ganged in series wiring, each pickup that is turned on increases the output volume by how many pickups are switched on. One bank of 2 pickups can be in the 'Rythm' position while the other bank of 2 is in the 'Solo' position. To get similar results, most other guitars require setting / blending the volume and tone pots separately into "Rythm" tone arrangements, but cannot be quickly switched between rythm and full-on lead guitar settings of all pickups' settings. 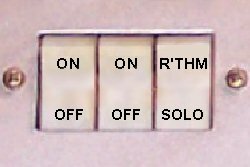 The 'Solo' switch positions do nothing but remove the 'Rythm' circuit from the whole circuit. Also; Pickups that are not selected 'On' are still in the total circuit with low and ever-decreasing volumes the farther away they are from the pickups switched 'On''; Providing a fuller range of tone fully accentuated by the much greater volume of the pickups switched on. Again, this low volume blending is accomplished by bleed through the back side of each pickups volume pots and the pickups ganged in series wiring. Each pickup's 'Off' switch removes the pickup by looping it's leads back upon themselves at the volume pots, and defaults to a circuit that routes the pickup through the back side of pots and lugs to blend the pickups in ever-decreasing volumes the farther they are away from the pickups selected 'On'; (see the Technical Circuit and Switching Logic page for detailed explanations). Each pickup's 'On' switch position does nothing but switch off the 'Off" circuit and allows the default wiring of that pickup to go directly to it's volume pot, gang in series with any downstream pickups switched on, and then to the tone pot and output jack. Any single or combination of pickups switched 'On' also feeds the 'Off' pickups back through the back side of each pot and it's lugs, ganging all pickups together but in ever-decreasing sharp volume reduction amounts the farther away the pickups are from the one single or multiple pickups that are switched 'On'.